The enduring symbol of the Kanawai Mamalahoe, the Law of the Splintered paddle tagged by police. Like most people, I would like to live in a clean, quiet, peaceful, and prosperous community. But at some point after the 2008 Crash, the homeless and their encampments began to expand into new parks, sidewalks, beaches -- even under freeway overpasses. I was surprised to see the "traditional" homeless spots so overcrowded, and even more surprised to see large encampments sprout all over the island. The burgeoning homeless population camping on the streets made many in the community uncomfortable -- as it should. But people felt too small and powerless to address the causes of this sudden rise in homelessness and instead appealed to their local politicians to do something to "clean up" the homeless, to put them out of sight, out of uncomfortable public awareness. The result was Bill 54 (that became 11-29 Revised Ordinances of Honolulu). This ordinance allows for the seizure of attended personal property (such as tents and sleeping bags) "stored" on public property such as sidewalks. But of course, the ordinance has nothing to do with storage of property at all. It's simply a device to further criminalize homelessness. It takes, or threatens to take, all the worldly possessions of those who have the least. Protester at the November 17, 2011 hearing on Bill 54. The overwhelming testimony against the bill predicted its use against the homeless and free speech. The City Council denied that would be the case. They also denied the ordinance would create additional costs for the City. 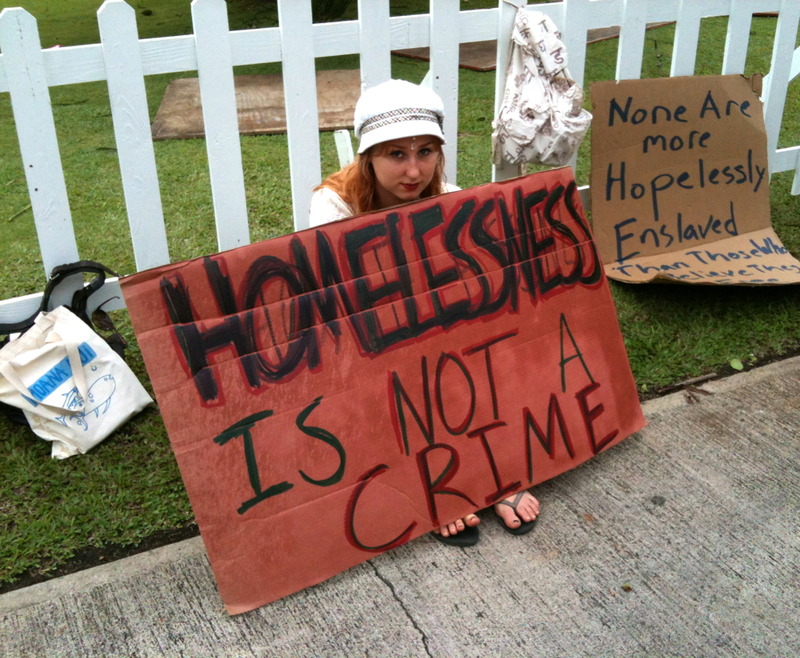 To date, the ordinance has ONLY been used against the homeless and Occupy Honolulu. 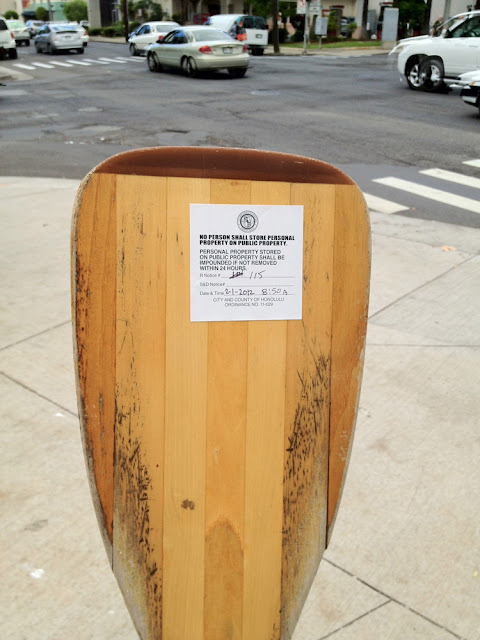 The reason the homeless are so conspicuous in the first place is that the only place they can legally take shelter is "by the roadside" as that is protected by the Kanawai Mamalahoe, the Law of the Splintered Paddle enshrined in the State Constitution. City ordinances will not allow them to take shelter within parks or any other public place other than designated shelters. The goal of the Occupy Movement (that began as Occupy Wall Street) is to address the inequitable distribution of wealth and the influence of corporations in government and society. In short, to hold those who caused the Crash (and the growth of homelessness) accountable for criminal acts. The urban encampments of the movement are new, unfamiliar, and disturbing to some people in the community. As many are aware, the Honolulu encampment has been subject to attempts at Bill 54 enforcement. While homelessness and protest are further criminalized, the real criminals -- Wall Street and its global partners -- have not been called into account. I would like to be able to blame Tulsi Gabbard and the Honolulu City Council for this shortsighted, ineffective, expensive, and repressive ordinance. But Bill 54 was created in response to public pressure, so ultimately, I must appeal to the community. It is my fellow citizens I must remind that the only peaceful community we can hope for is one that is just. We must stop harassing the homeless, the victims of the crimes of the super-rich. We should vigorously support the creation and maintenance of public forums in public places. Allow Occupy Honolulu to maintain its encampment as a public forum to build support for bringing the real criminals to justice. After the first day of trial, Megan Brooker was asked if police harassment has had a "chilling effect" on Occupy Honolulu. Justice ensures the peace, and it has always come only after long and arduous struggle. You can't simply make laws to simulate its appearance. No justice, no peace. Repeal Bill 54.